If I read the Thunderbolt’s specs correctly, the frequency stability (measured over 1 second) is 1.4 x 10^-11 so that’s about the same drift asthe 1.1E-11 you concluded as RFS drift. This makes me wonder if you did not just measure the GPSDO drift instead. As I understood the RFS delivers a very stable output that drifts but always in one direction whereas the GPSDO lacks stability but is being corrected to make sure it does not drift. Thanks for the questions Rob. The 50 MHz oscillator is used for measuring short time interval of approximately 20,000 ns (1016*20ns) with a resolution of 20 ns. It does not need high accuracy/stability. The 20 ppm oscillator uncertainty corresponds to 0.4 ns uncertainty (for the 20,000ns measurement interval). This is much smaller than the measurement resolution of 20 ns. The time interval measurement is spot on (within the 20 ns resolution). The 1.4^-11 figure you looked at is the Allan deviation figure. The PPS accuracy of the GPSDO is 15 ns. This means that any given time, the clock output of the GPSDO is accurate to within 15 ns of UTC. 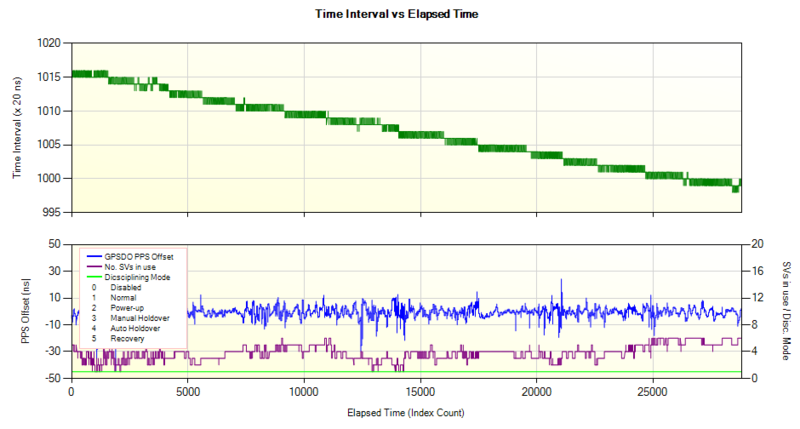 Over the 8.3 hours of the experiment, the clock of the RFS changed by 320 ns when compared to the GPSDO. This 320 ns drift is much longer than the 15 ns possible error due to the GPSDO. This is why I attribute this 320 ns of error to the RFS drfit.